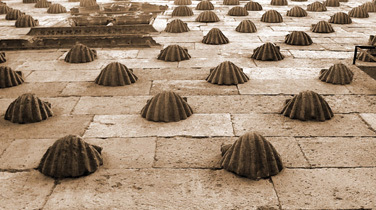 The Shell House is the most representative monument of the civil arquitecture at XV century, times of the Catholic Kings, mixing the gothic arquitecture with some rennaissance decorative elements. 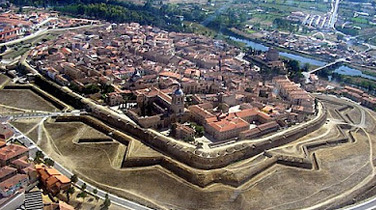 The building was begun at the end of 1490, property of Mr. Rodrigo Arias Maldonado, who was professor at Salamanca"s University. Mr Maldonado died in 1517. Him, he was Knight of Saint James of Compostela, because of that, according to tradition, the house is adorned with many shells, more than 350. Some other historians says is due to the coat of arms of her wife"s family. Its central patio is decorated with the typical arches from Salamanca. Now it houses a public library. It is the capital of the region of Ciudad Rodrigo, the judicial district of Ciudad Rodrigo and the diocese of Ciudad Rodrigo, with a different but very similar demarcation. Have titles Ancient City, Noble and Loyal. This is the most important city south of the province.